I know, stop groaning. I'm putting Christmas decorations away, but you should know, I have a tradition. I've been making my first card of the year on the first day of the year. Been doing this for years. So....ta da.....here is my first Christmas card of 2015. I'm sharing on the Sparkles Christmas Challenge. As always, there are prizes. These are two of my favorites....How about you? Check it out on the Sparkles Christmas Challenge Blog. My digi stamp is from Bugaboo....Isn't this a sweet little bear? I think so. My Christmas die is from Poppystamps. I love this one. Well, enough from me. I'm off to enjoy the day, which will be relaxing at home with my DH and my puppies and kitty. I love this kind of day. Until later, Happy New Year! Thank you for following my crafting journey. I look forward to a year filled with seeing all the wonderful things you are creating. 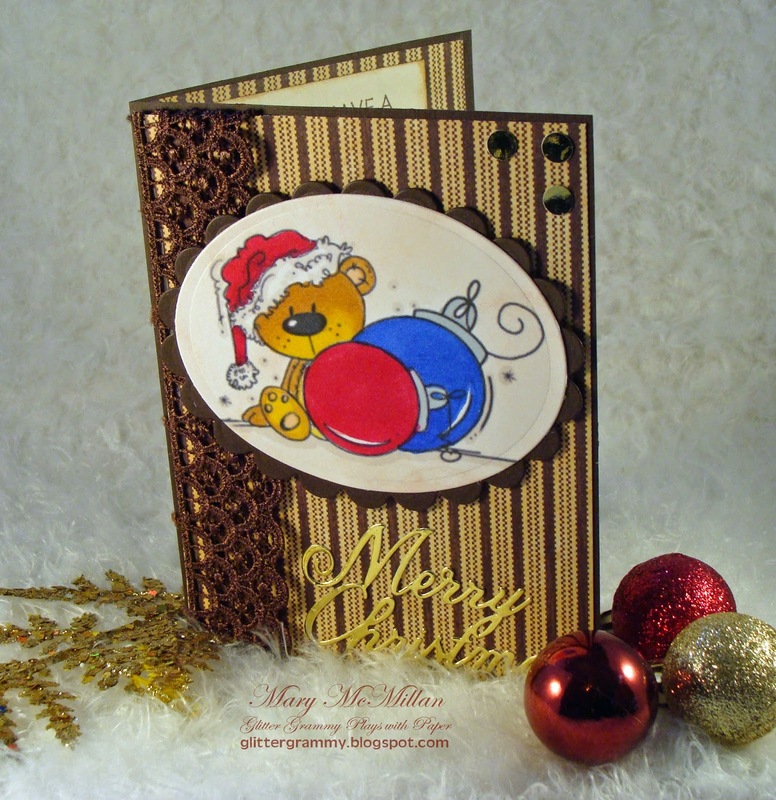 Lovely card Mary with a cute image, wishing you a Happy New Year. Congrats on getting started on 2015 Christmas cards . . . I'm right there with ya Sistah! So cute! You know I LOVE that beautiful brown lace on the side.